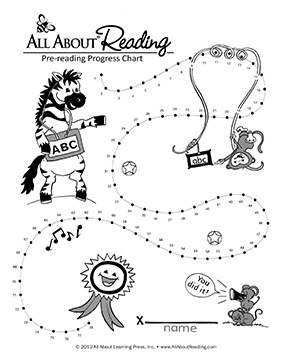 All About Reading Pre-reading Deluxe Package - All About Learning Press, Inc.
Our All About Reading program is unique because it begins with a Pre-reading level for preschoolers and kindergarteners, and it focuses on what we call the Big Five Skills. These five fundamental pre-reading skills include letter knowledge, phonological awareness, print awareness, listening comprehension, and motivation to read. It is this specific set of skills that helps pre-readers understand the basics of language and how it works, preparing them to learn to read. With All About Reading Pre-reading, your child will play special games, enjoy little crafts, and engage in charming storytime activities, all the while absorbing these all-important Big Five Skills. This is our most popular option. Includes everything in the Basic Package, plus a Review Box, Reading Tote Bag, Ziggy Zebra puppet, and Adorable Animal Stickers.